Rama is a quantitative junior researcher specializing in economic development. His main research interests include poverty, inequality, and education. He is responsible for data collection as well as analyzing and supporting the dissemination of research findings. 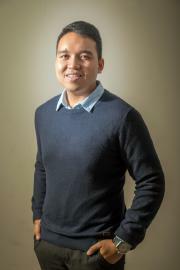 Prior to his career at SMERU, Rama was involved in management consultancy for two years with KPMG and Deloitte Indonesia with client projects ranging from private entities, state-owned enterprise, as well as government ministries. He was also a teaching assistant in the economics department of the Australian National University in 2015.